LAS VEGAS: On Tuesday, January 22 (Manila time) marks the exact 24th anniversary of Manny Pacquiao’s professional boxing career. It was on that day in 1995 when a skinny 17-year-old boy from General Santos City in far away Mindanao, who only weighed 98 pounds, seven pounds under the required 105-pound to fight as a light-flyweight, that he had to put coins in his underwear to make the weight. Of course no one knew at that time in Occidental Mindoro that the boy, who was introduced to fight a certain Enting Ignacio, whom he beat by points, in a four-round curtain-raiser would someday become the toast of the boxing world as the only man in the history of sweet science to win championships in eight weight divisions. Meaning in all those 24 years of swapping punches against who crossed his path, the Pride of the Philippines has scaled a total 47 pounds to reach the 154-pound super-welterweight (junior middleweight) category. On Saturday (La Vegas time), Pacquiao is defending his World Boxing Association welterweight belt against title pretender Adrien Broner at the MGM Grand Arena and at age 40 will try to emulate similarly ring legends George Foreman and Bernard Hopkins, among others, whose greatness were measured not only by their accomplishment in their prime, but, likewise late in their career. Foreman, it can be remembered, regained the heavyweight title in 1994 at age 45, as he established a remarkable new milestone. It lasted until 2013, when Hopkins upped the ante by annexing a piece of the light heavyweight title at 48. Pacquiao (60-7-2, 39 KOs) last fought in July 2018, when he TKOed then defending titlist Lucas Matthysse in Malaysia that earned him the WBA version of the 147-pound division. The fighting senator is set out to prove he has much gas left in the tank and keeping the title will certainly make that point clear. The controversial Broner (33-3-1, 24 KOs) will attempt to earn his first victory since January 2017 when he lost by unanimous decision to Mikey Garcia, can somehow upset Pacquiao. Broner battled Jessie Vargas to a majority draw last April. ​ Broner is a counterpuncher, and the Filipino great has had problems with counterpunchers like Floyd Mayweather Jr., who outclassed him and Juan Manuel Marquez. The trash-talking American challenger though doesn’t have the skills of Mayweather or the timing of Marquez to catch Pacquiao on the way in, so no advantage, training consultant Freddie Roach said. 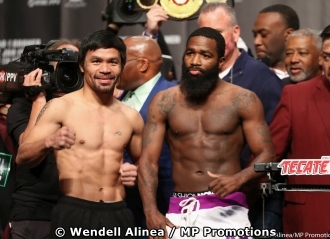 Besides, Broner looks struggling with volume punchers like the Filipino who’s fast with combinations, especially at 147 pounds class, according to Pacquiao’s conditioning coach Justin Fortune. Broner doesn’t hit back with more than one punch,” Fortune said of the challenger’s capability to respond to quick-punching opponents.